Potentially, Everything is Light - Fact or Myth? It is plausible that "everything in the universe can at its core be explained by electromagnetic energy" (AKA light). Is “Everything Light?” Can We Describe the Universe By Considering only Electromagnetic Energy? 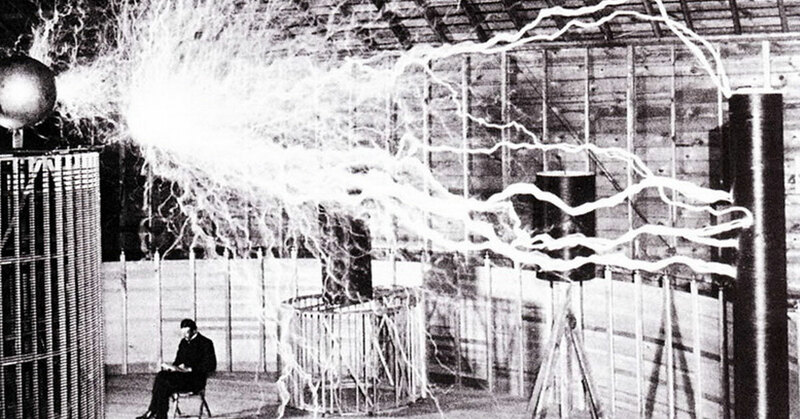 Nikola Tesla was said to have said “everything is light.” That is potentially correct. In theory, the universe could be explained by electromagnetic energy… with this being the case even though Tesla likely never said this. Of course the above is just theory, and a number of qualifiers are needed to make that claim anywhere near plausible. With all the idea that there are a number of asterisks and caveats to be considered alongside this claim in mind, below we explain how the idea that “everything is the light” isn’t as far out as it seems. “We can explain everything about the universe (aside gravity and nuclear force) by understanding electromagnetic energy. Even the laugh of the audience when I say that statement can, if our theories are correct, likely be explained this way.” – Paraphrasing Richard Feynman speaking on Quantum Electrodynamics (the study of energy on the quantum level). TIP: On this page we are using “light” as a synonym for electromagnetic force in any state. We are not only talking about our perception of light as electromagnetic radiation within a visible portion of the electromagnetic spectrum, we are talking about all electromagnetic force, “energy,” photons, electromagnetic force bound in electrons, electromagnetic force in fermions, photons stored as potential and kinetic energy, virtual photons, etc (which, if Tesla did actually say “everything is light,” is what he would have been talking about, and in the Feynman quote above, this is what he is talking about). Thus, the page could just as easily be discussing the idea that “everything is energy” or that “everything is photons” or that “everything is electromagnetic energy,” etc. We aren’t looking at semantics, we are looking at a metaphysical aspect of theoretical physics. First off, the Nikola Tesla interview from which the quote supposedly comes is almost certainly fake. Despite this, Tesla was clearly interested in electromagnetic energy and the takeaway still has merit (let’s not get into the discussion of the origin of that “interview” here, let’s just examine the claim at face value… as it is arguably more interesting than the story of “the interview” likely being part of a play about Tesla from Eastern Europe). Second off, from one perspective “light” is what we call certain wavelengths of electromagnetic that our eyes can perceive as different colors…. However, for the claim “everything is light” to be taken seriously at all, we have to consider “light” to be a synonym for all electromagnetic force (where photons, light, electricity, magnetism, electromagnetic force, that which arises like electrons, etc is all the same thing). Further, some form of electroweak theory (that weak force and electromagnetic force existed as one at some point) has to be correct, and some form of “grand unification” theory (that strong, weak, and electromagnetic force existed as one at some point) has to be correct. With the above in mind, the standard model of particle physics shows us that all fundamental quantum particles each only have a few properties. Those properties include things like mass, charge, and spin (see chart below, those are key properties, not the only properties). Those properties are feasibly all explained as mass-energy in motion in relation with other mass-energy in motion (like countless magnets moving at light speed in different geometric relations sharing energy), and therefore feasibly explained by light. The first part of the image shows the particles make up all known matter and energy. Of those, only the gluon and photon are massless. 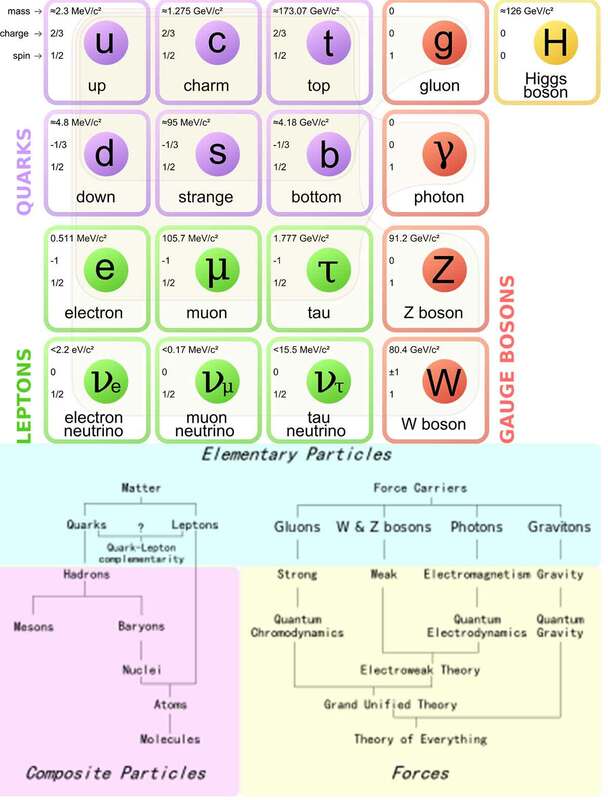 The second part shows how all the forces and fermions of the standard model relate. As you can see, we can break this all down to just a few key properties. All of which relate back to terms like mass-energy. Now, if we note that: 1. Mass is potential energy (which can be released as kinetic energy as photons), 2. charge is kinetic energy (which can be released as photons), and 3. spin is a type of motion (a quality, and one of the only qualities, of electromagnetic energy is that it always travels at light speed unimpeded), we can see that everything a given quantum particle does can potentially be explained by photons. Further, when particles exchange energy, they do so via the four force particles, by exchanging “virtual particles.” Virtual particles are all essentially “virtual photons” despite there being many different types. Now consider, all standard model particles are essentially composite particles made from massless energy particles (although to be fair the can also all be thought of as wave-particle vibrations in their given quantum fields; which is strange enough on its own… is that vibration always electromagnetic at its core, or is it not?). Moving on, and to the above point, the only two massless energy particles are the photon (the carrier of electromagnetic force) and gluon (which “glues” quarks together). Here we can note that the photon mediates electromagnetic force, the gluon mediates quarks (a quark is a composite particle that contain electromagnetic force). Now consider, everything in the universe is made from atoms, atoms are made from composite particles, and composite particles are made from massless particles, and thus are made from gluons and photons (AKA being made of star stuff). In other words, if we use “light” as a synonym for all electromagnetic force, and then we assume a bunch of theories related to electromagnetic force, we can say “all known standard model particles” can be explained by photons to some extent (in theory). Thus, the theory that Tesla is said to have said but probably didn’t… is plausible. In fact, I’d say it is more plausible than any other theory that suggested that there was one single substance from which the universe is created. Clearly, electromagnetic force is at the core of everything to some extent, but is it the ONLY thing… that is a question we can’t answer for sure. TIP: If everything is light, then the only thing that isn’t light is “nothing.” Oddly though, one can’t look in the universe and actually find nothing. The One-Electron Universe | Space Time. There is a good chance Tesla never gave an interview where he said “everything is light”… however, if he did, that would have been a really interesting hypothesis worth exploring. As you can see above, we can’t prove “everything is light,” but what we know about quantum electrodynamics and the standard model and such means we probably won’t be taking the “everything is light” theory of the table for a while. Now consider 1. one can record information with light, 2. from the perspective of the theory one could argue everything is just light arranged in geometric patterns organized to best share energy, 3. and lots else… Spooky [action at a distance]! 1899, Interview with Nikola Tesla <—almost definitely not real. Meh, I’d still have to say that light is only electromagnetic energy in the human visible range. Other than that quibble, I don’t have any problems with this. For sure. I am using a the term light very broadly here to encapsulate everything photon. Visible light would only be a small part of what I’m referring to in this article. Here I’m doing this to show that the [almost certainly fake] Tesla quote isn’t as strange as it seems. Your quibble is justified though. There are no “particles” per se. Light doesn’t really “move”, either — it propagates where it is unimpeded and reflected, and decays where surrounding sympathetic vibrations cause it to be absorbed more readily than reflected. Actually, none of it is as real as most people think. What if all of your senses were taken away? No sense of touch, eyesight, hearing, taste, or smell. What is left? You could still be alive, but without the ability to perceive any of those things, what would life consist of? I don’t even think I could form a legitimate thought without the ability to associate something from one of the five senses. If I had never had any of them, then it would be impossible to be aware of any part of the universe. This fact should tell us one thing for certain: We are an integral part of the idea of physical existence at the most fundamental level. There is literally nothing to think about that doesn’t involve our senses — all of which exist only as a function of our interaction with some other physical thing. It also hints at an answer the “afterlife” question. Maybe you’re alive from a technical standpoint after your body dies, but if you don’t have any way to perceive anything, then how would you know? Really cool thoughts. Thanks for sharing.